WANT TO LEARN TO KITESURF? GoKite offers professional kiteboarding tuition to get you riding fast, and make sure you stay safe, while having maximum fun.Learn to kite board with some of the best Kiteboarding instructors from around the world. Our training programmes are based on the Kitesurfing Australia (KA) standard alongside our highly proved tried and tested teaching methods.GoKite offers the opportunity to try Kiteboarding with the “Get Hooked” or “Get Wet” passes, but once you become hooked we offer great value “upgrade” packages to continue your learning progression to becoming a competent Kiteboarder.Lesson prices include all top of the range Cabrinha equipment with Neil Pryde Surf accessories and safety gear. So to get started you’ll just need beachwear and bathers.Bookings can be made online or by calling manager Kayleigh at GoKite on 0428 465 483 between 9 – 5 daily. Our new 8 hour lesson package. 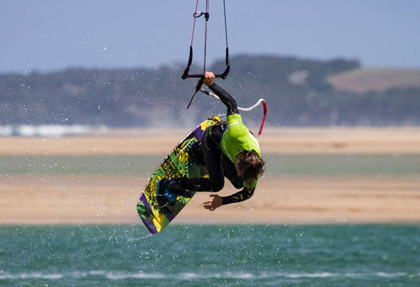 The very best, safest and most affordable way to kick start your kiteboarding. You can never have too many professional lessons. Have the confidence to be independent and ride your own gear!